CELEBRITY BILLIONAIRE Donald Trump has publicly pledged his support for Mitt Romney’s bid to secure the Republican Party’s presidential nomination – a move which could help Romney secure the cash he needs to lock down the nomination. Announcing his support in Las Vegas last night, Trump – estimated to be worth $2.9 billion by Forbes – said Romney was “not going to continue to allow bad things to happen to this country” if he won the presidency. Speaking to Fox News after his announcement, Trump said Romney had the best chance of defeating Barack Obama in a head-to-head contest – saying Obama had “tremendous baggage” that would make it difficult for him to retain the presidency. CNN quotes Romney as responding by commending Trump for being “one of the few who has stood up to say China is cheating”, and complementing his history of creating jobs. Its report also noted that the endorsement comes only 10 months after Trump – who at the time was himself a prospective Republican nominee – condemned Romney for his experience in the private sector, where his job involved asset stripping and closing down firms. Although he has since left the Republican Party, Trump refused to rule himself out of the running for a Presidential nomination – merely telling Fox that he would not run if Romney was to clinch the Republican nomination. Though Trump pointed to the timing of the next series of The Apprentice (which begins in two weeks) as an impediment in allowing him to run, that series would conclude by mid-June – meaning Trump would still have enough time, and resources, to mount a serious third-party campaign if he wanted to. The Las Vegas endorsement comes two days before the Republican primary in Nevada, where Romney enjoys a 20-point lead in the opinion polls. Winning in Nevada, which has 28 delegates to offer, would further strengthen Romney’s grip on the nomination and dent the hopes of Newt Gingrich, who is considered Romney’s most potent challenger. 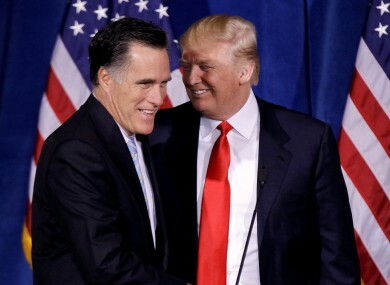 Email “Donald Trump endorses Romney's bid for Republican nod”. Feedback on “Donald Trump endorses Romney's bid for Republican nod”.